Graman Quacy (or Kwasi) was a healer in the eighteenth century Dutch colony Suriname. He was probably born in the late seventeenth century, in the part of Africa that is now Ghana. The main way historians know about him is through the writings of John Gabriel Stedman, a British soldier and writer. 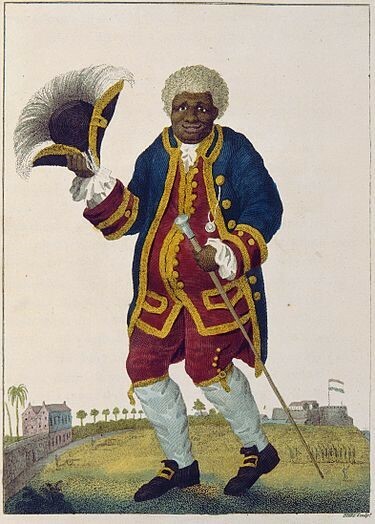 Stedman wrote about Quacy in his Narrative of a Five Years Expedition against the Revolted Negroes of Surinam, which was first published in 1790. Graman Quacy was remarkable as an African-born healer in a European colony, who was greatly respected by the European colonists as well as by enslaved Africans, and who became well off as a result of his healing activities. John Stedman knew Quacy personally. He described how Quacy visited him to show him ‘his Coat, Gold medal, &c. Which he had got in a Present from the Prince of Orange’. Stedman believed Quacy was ‘one of the most Extraordinary Black men in Surinam or Perhaps in the World’. William Blake (1757-1827), ‘The Celebrated Graman Quacy’. Courtesy National Library of Scotland. Print showing Graman Quacy, in gilt-edged red tunic and leggings, with gilt-edged blue coat, holding feathered hat in his right hand and cane in his left. The Corps of Ranger & all fighting free negroes are next under his Command, to Whom by Selling his Obias or Amulets to make them invulnerable, /they under the Power of this Superstition fearing no danger & fighting like bull dogs. small Pebles, Egg Shells, Cut-hair, Fish bones &c. the whole Sew’d up together in Small Packets which are tied in a String of Cotton Around Some part of theyr Body. Quacy also discovered a ‘Valuable Root’ which became known at the time as ‘Qwacy Bitter’ and was used, according to Stedman for ‘strength’ning the stomach, Restoring the Appetite &c’. The plant was named Quassia amara by the Swedish botanist Carl Linnaeus, and is still used as an insecticide and as treatment for stomach pain. Stedman, John Gabriel. Narrative of a Five Years Expedition against the Revolted Negroes of Surinam, Transcribed for the First Time from the Original 1790 Manuscript, edited Price, Richard and Sally Price. New York: iUniverse, 2010. Susan Scott Parrish, ‘Diasporic African Sources of Enlightenment Knowledge’ in Delbourgo, James, and Nicholas Dew, eds. Science and Empire in the Atlantic World. New York: Routledge, 2008, pp. 281 – 310.